Bryan/College Station, Texas – November 20, 2018 –The Brazos Valley Bombers will have more than just a few familiar faces in the dugout this summer. In addition to the entire coaching staff returning, the Bombers will bring back two of their top offensive threats from the 2018 season. 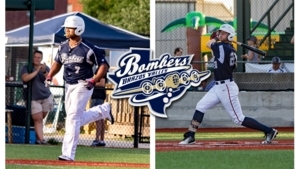 Cole Coker, from Lamar University, and Cam Haller, from Cisco Junior College, will be seen roaming the outfield again for the Bombers this coming summer. “This a good day for the Bombers” said Manager Brian Nelson. “Coker and Haller are both really good ballplayers and extremely talented, but the energy they bring to the ballpark every day and their leadership in the dugout is what makes those guys so special. We are fortunate to have them back with us”. Cole Coker returns to the Bombers after a successful 2018 summer campaign where he led the team with 190 total plate appearances and hit .312. “I’m really excited to be back” says Coker, “I’m glad to hear that the same coaching staff is back also. I loved playing for this team and for these fans”.The left-handed hitter was a versatile offensive player for the Bombers, providing consistency at the plate and speed on the bases. Coker led the team with 54 hits, was 2nd on the team with 28 RBIs, and swiped 16 bases over 42 games.